Although at the outbreak of the World War II the British Army already had the excellent Daimler Dingo, the need for scout cars could not be met by Daimler alone, so other companies were required to produce similar vehicles. One of these companies was Rootes group, which in 1942 built a vehicle similar to the Dingo in layout, but slightly larger and heavier. The vehicle carried a crew of two, with an emergency seat for a third member. It was equipped with a No. 19 radio set. The armament consisted of one Bren light machine gun with a 100-round drum. This was mounted on a Parrish-Lakeman mounting above the roof, and could be operated from inside the vehicle. Production of the vehicles continued until 1945. At least 4,298 were ordered and at least 4,102 delivered, 1,698 of them Mk I. They were used by British armoured units (e.g. the 11th Armoured Division) for scouting and liaison and were generally considered less capable and reliable than the Dingo. A number of vehicles were given to the Polish II Corps and the 1st Czechoslovak Armoured Brigade. After the war, the vehicle was used by some European armies. Belgian police continued to use the car until 1958. Readers who like movies will notice a rather remarkable likeness of the figure on the box art to Michael Caine who spent considerable time in one during the making of the movie 'A Bridge Too Far'. Bronco has established quite a reputation in the armor crowd for producing interesting and good quality kit, though many think they are a bit pricey. This kit is no exception and is superbly molded in OD plastic. Rattling around in a box about twice the size it needs be were also rubber tires and a nice photo-etch fret along with a nice resin figure, who also looks a bit like Michael Caine! All of the sprues are separately packaged to prevent rub marks and breakage from part s interlocking. I could find no molding flaws at all and what ejector pin marks there are will be invisible once the kit is built. Well, let me amend that a bit. The interior of the vehicle is festooned with them. It does appear that the full interior that is provided will cover these up, though I really couldn't say that for sure unless I built it as one might have a fill a few. Yep, this kit has a full interior, and what's more, there is a full engine to go along with it. As you might expect, most of the photo etch will be used on the interior though there is plenty for the bits and pieces on the outside as well. Instructions have been, in my experience, a bit of a problem with Bronco. It isn't that the assembly diagrams are not good, for they are. In fact, the instruction book is 16 pages with most of those devoted to sticking bits together. It isn't that there isn't a good color chart, for it has a fine one referencing four paint brands. The markings guide for the six vehicles is OK, but a bit difficult to make out exactly everything as it is all crammed onto one page. In fact, one needs to study that first as it tells whether certain bits are left off or not. It is just that figuring out the color of the interior will take some major sleuthing. One assumes that it is white as about half way through the build, after you have most of the interior bits in place, it shows the upper cab as being this color. No direct indication that the rest of the compartment is this shade, though it does point out several components to be painted various shades. Like British Olive Brad 15! 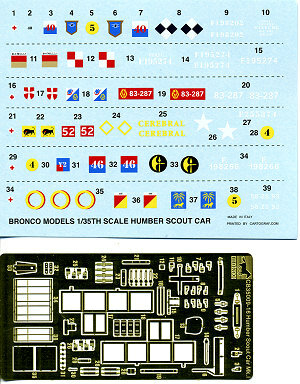 Decals are nicely printed and provide markings for six vehicles including some that are post-war. The end result should be a most impressive and well detailed model of this important British recce vehicle. For those of us who like wheeled military vehicles, this one is pretty much a 'must have'. If you would like your product reviewed fairly and quickly by asite that has near 400,000 visitors a month, please contactme or see other details in the Note toContributors.